The price of bitcoin has remained relatively stable over the last few days, in contrast to the turmoil of last week. Other major cryptocurrencies have had mixed fortunes, with dogecoin seeing a rise in value of almost 25% over the last 24 hours and the beleaguered darkcoin falling a further 12.5% in value. It is too early to tell what has caused the significant surge in dogecoin prices, with some members of dogecoin forums suggesting a "pump and dump" triggered by Chinese investors, while others have given a nod to the often arbitrary nature of such events by linking it to the price of pineapples. "I knew this was going to happen, because this morning the girl next to me in line ordered pineapple on her breakfast burrito, thus reducing the supply of pineapples," a Reddit user by the name of Fiddy-doge said. 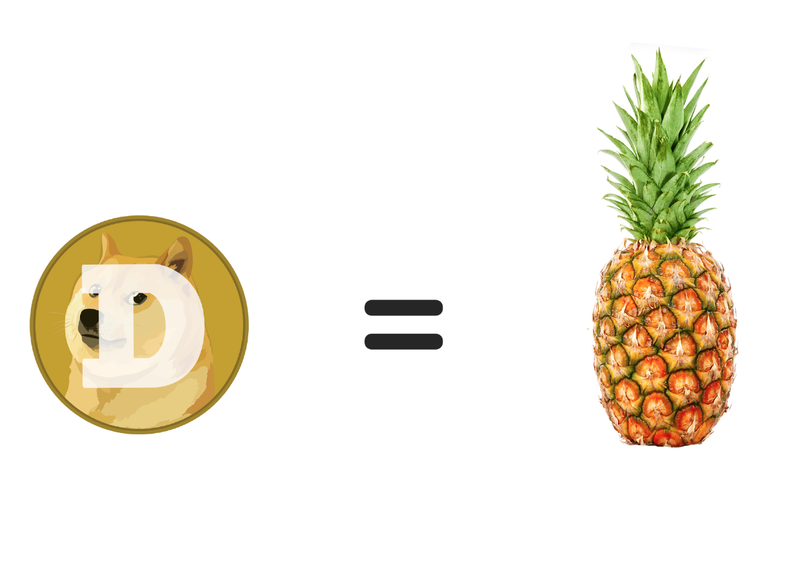 "The link between pineapple price and doge price has been well established by dogeconomists." Last month's announcement that Ecuador is to outlaw bitcoin and other established cryptocurrencies in favour of its own electronic currency has been criticised as a "ploy" to finance a political agenda. Mary Anastasia O'Grady, an editor of the Wall Street Journal and co-editor of the Index of Economic Freedom, said that the move mimicked the economic injustices perpetrated throughout the 20th century by Ecuadorian governments who engaged in monetary devaluation in order to "steal from the poor". "Ecuadoreans are not free to speak against this threat to their earnings and savings," O'Grady wrote in a recent column. Earlier this month (President Correa) won the passage of a new law that makes it a crime punishable by up to seven years in prison - to "publish, broadcast or spread' news that creates 'economic panic". "The law suggests that the brash University of Illinois-trained economist is well aware of the trouble his funny money is likely to cause." South Korean bitcoin startup Korbit has announced $3m in Series A funding led by SoftBank Ventures Korea. Korbit, the first Korean Won-to-bitcoin exchange, claims to have around 25,000 individual registered users and more than 400 merchants signed up. "Bitcoin provides big advantages in terms of cost savings and ease of use compared to traditional currencies and credit cards," SoftBank Ventures Korea Partner Kangjoon Ryan Lee, told CoinDesk. "Going forward, bitcoin can play a role in a wider variety of industries, for example enabling machine-to-machine transactions or acting as a platform for smart contracts." Online marketplace Cannabis Road has suffered an attack that has so far resulted in around 200 bitcoins ($100,000) being stolen from the site. The site is currently down while the attack is investigated and visitors to Cannabis Road are now met with a message from lead developer "Crypto". "At first I thought it was a mistake, until I double checked, and triple checked, only to find out, we had in fact been robbed not 15 minutes earlier," Crypto's message reads. "I am deeply sorry that I have failed you as a developer and a leader, and if I can figure out how this happened, maybe you will find it in your hearts to move past this and help us bring Cannabis Road back to life once again."